Visiting Vancouver for 48 hours, and not sure what kinds of things you should be getting yourself into? Fret no more: I've got all of the best answers for you on everything from where to stay, what to eat, and what fashionable places to explore. Amongst many coffee stops, explorative walks through Chinatown, meanderings with all things vegan and gluten-free, and likely several upward glances from beneath your umbrella, you are bound to find so much enjoyment in these gems, all of which I can stand behind as a local of Vancouver. SHANGRI-LA VANCOUVER: If you have the opportunity to visit Vancouver, even if just for 48 hours, definitely stay at the Shangri-la Vancouver. Not only is this hotel arguably one of the most luxurious places I've stayed in my life, you will also find that this hotel is extremely convenient. Their on-site amenities, like their outdoor pool and hot tub, are beyond fantastic. Plus, the location is extremely convenient in the heart of downtown, and the staff are incredibly accommodating. If you do have the opportunity to stay here, also make sure you indulge at CHI, The Spa at Shangri-La. I was literally and figuratively lulled to sleep with an 80 minute relaxation massage, which starts with a foot soak/rub, following a 10 minute steam, and continuing with an hour full-body massage in the most relaxing, ideal surroundings you can imagine. 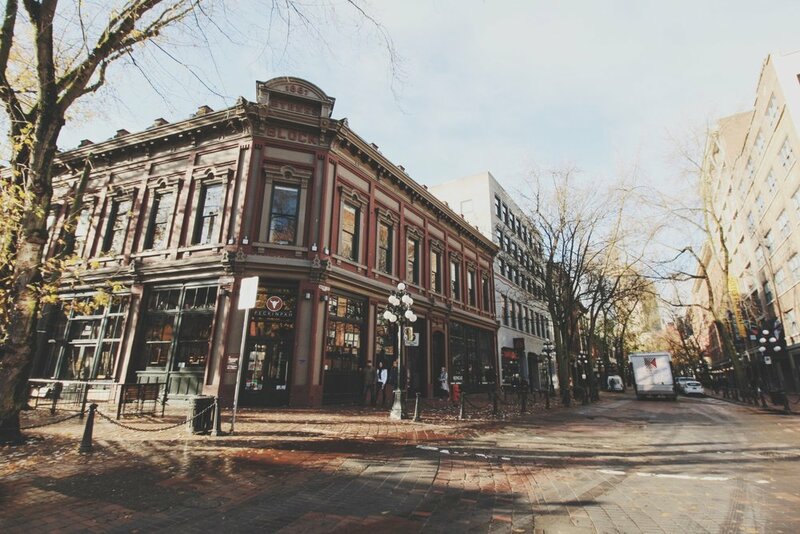 L'ABATTOIR: Nestled in Vancouver's historic neighbourhood of Gastown, you are bound to walk past this delicious gem anyways, so be sure to make a reservation for a dinner on one of your evenings in Vancouver. This upscale, modern little bistro is both cozy and energizing, but what you might not immediately realize about L'Abattoir is that the building was constructed in the 19th century and actually housed Vancouver's first jail. Don't worry, though, you'll feel far from imprisoned the moment you taste their food. Get adventurous, and try the snails – they are delicious! MARKET by JEAN-GEORGES: Located at the Shangri-la, Market by Jean-Georges is another must-try in Vancouver, and one that looks out on Alberni Street – one of the fashion destinations in the city. I'd recommend trying the smoked salmon pizza, and ask the awesome staff to help you with a complimentary wine-pairing. SECRET LOCATION: This high-fashion concept store located in Gastown will have your mouth-watering and eyes widening before you even step inside. But, when you do, you'll immediately feel like you're Alice entering the world of Wonderland. Here, you'll find some niche designer brands like Yazbukey and unique 2-of-a-kind pieces like this incredible 22/4 jacket (with matching pants) I tried on. The best part of this fashion hub in Vancouver? They keep things very exclusive, and will lock the doors when the number of available staff meets the number of guests. This way, you always feel like you're getting a private shopping experience. Better yet, contact Secret Location and book your private shopping experience ahead of time. VANCOUVER LOOKOUT: There's no better place to see all of Vancouver than the Vancouver Lookout. Here you get a 360 degree view of downtown, Chinatown/Gastown, and the Northshore Mountains. To make the navigation of your Vancouver trip really simple: simply pull up your Instagram freed and search #48Vancouver or #VeryVancouver. Here you'll find unlimited destinations all curated by Tourism Vancouver and their local followers and international visitors. Check out this little video capturing some of my favorite experiences during my 48 hours in Vancouver staycation in Vancouver, which is quickly becoming not only my home, but my favorite city in the world.